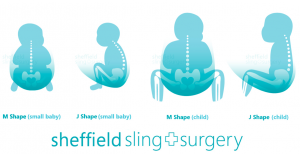 I have made several educational useful videos and photo tutorials to help people, which can be browsed on my local Sheffield YouTube channel (I run a sling library there). If you are looking for a specific video for a particular type of sling, please see the categories below. 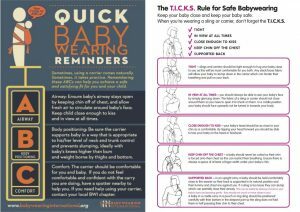 Here are some safety reminders, please ensure you know how to protect your baby’s airway and ensure a good position for them before you use a sling. Please note that these videos are to be used at your own risk. There is no substitute for hands-on help! Always keep your child safe. 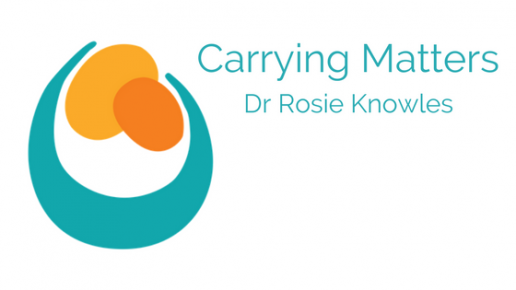 Here are some reminders of the positioning of babies and children in carriers. Young babies should be held in this supportive tucked position that respects their natural anatomy. The M shape describes the shape of the legs; with knees higher than bottom. This is how babies naturally position themselves when they are relaxed and held in arms, or resting on the floor or in reclined seats. A newborn has a much narrower M shape than an older baby (and each baby will open his/her hips at his/her own pace). The J shape describes the shape of the head and spine; a gentle curve with the pelvis tucked under. Having a tuck at the base means that the heavy head is less likely to slump over. Chin can be kept up and the chest cavity kept open and uncompressed. Many parents love to use a stretchy wrap for their newborn; it is very comfortable as it distributes the weight widely around the body . It is also very snuggly for babies and reminiscent of the warmth and gentle pressure all around that they enjoyed in utero. The videos in this section look at soft structured carriers (full buckle carriers and meh dais/bei dais (formerly known as mei tais), showing you how to use them for front, hip and back carries, as well as how to make a good seat in a carrier with the pelvic tuck. FWCC style carry with waistbandless carrier (spreads the top edge of panel more widely and brings knees higher) please note this is not officially endorsed. Back Carry with the secure chestbelt done up (wrapyouinlove video) “walk like an Egyptian”. Ensure chest belt is strong and secure. Back carry with cross straps on the front! Ring slings are a popular choice with parents wanting something simple yet versatile, and they can be used from newborn to toddlerhood and beyond. There is often a learning curve to making them as comfortable and safe as possible; the videos in this section will show you how to use them well. Practice makes perfect and sometimes some one-to-one help can make all the difference. Woven wraps are very versatile and can be used for children of every age, from newborn to preschooler, on the front, hip and back. They come in several different lengths –read more here. In this selection Rosie demonstrates just a few of the possibilities and links to other excellent videos to help you make the most of your woven wrap. My favourite woven wrap YouTube channel is Hedwych’s Wrap you in Love, a real treasure trove.